Today was a pretty uneventful day. The Munchkin had fun with Stephanie while I was at work. 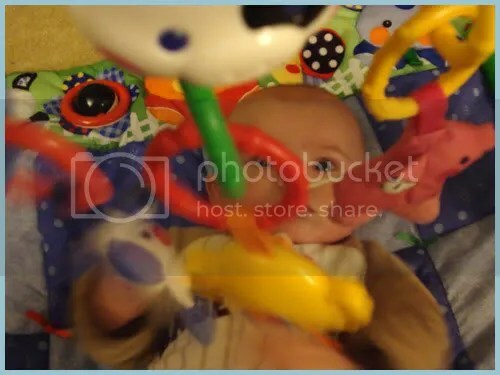 He still has lots of fun playing with his farm toys, the ones on his swing, and the ones on his bouncy chair. I don’t think I’ll be using the bouncy chair much longer though, because of how far back he makes it go when he’s in it now – such a big boy! Stephanie was SHOCKED at how much he had changed in the week that she was away. She couldn’t get over how The Munchkin doesn’t hate tummy time with a passion anymore, and how much he likes his toys. She said that she didn’t even put him in his swing; that they played with the farm toys all day. (That kind of worried me because of the back of his head though…) She also said that they did neck stretches; ear to neck and left to right, which was good. When I got home from work, we went out and voted. All the little old ladies working at the polling place loved him, of course. Our little flirt. One lady offered to hold him while I voted, and I obliged, but then I was so preoccupied with “Gah, random lady has my baby!” (Even though I could see him and he was fine, CRAZY.) that I just voted a straight ticket. After that, we just hung out on the couch, half watching the election coverage, and half messing around on facebook/twitter. I think we’re going to head off to bed soon though. I’m going to try and stay up for The Daily Show, but I’m so tired, OMG.